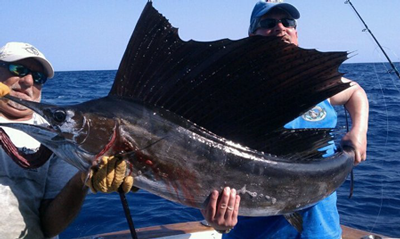 Book your Key West Florida fishing charter with Cowboy Charters Sport Fishing! Located in beautiful Key West, FL, we have both private and shared charters available. Key West and the Florida Keys are well known as the fishing capital of the world and hold more world records than anywhere else. We have been charter fishing the waters off of the lower Florida Keys since 1965 (53 years) and have been the winner of many fishing tournaments. Fishing is a family tradition for the Baumgarten family. Hans Baumgarten started Cowboy Charters in 1965 and his son and grandson have carried on and expanded the family tradition. You will experience both friendly and professional crew on the well appointed 36 FT, & 45 ft Hatteras yachts, and 40 Ft Luhrs all with twin diesels, when you join Mark Baumgarten and crew for a day of sport fishing either offshore, reef, wreck or inshore. Mark has been fishing professionally for over 45 years and has been consistently able to find that trophy fish for his customers. Air Conditioning-1 on 36 ft, 2 on 45 ft. The Cowboy Cowgirl SportFishing charter boats in Key West, FL are some of the most comfortable sport fishing boats in the keys. We have both private and shared charters available.